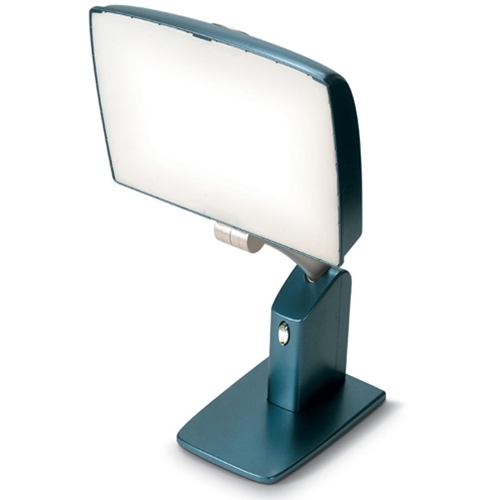 Uplift Technologies DL2000 Day Light Sky from HealthyKin.com is designed to provide optimal bright light therapy treatment and for the user. The two-light setting provides 10,000 LUX, while the one-light setting provides convenient task lighting. Engineered and tested to provide the field of illumination and 10,000 LUX experts recommend for maximum therapeutic benefit. The Day-Light Sky light enclosure is 33% smaller than the Day-Light Classic while mainlining the same field of illumination, adding versatility for the user. The Day-Light Sky is designed for discreet use in the home or the office, providing bright light therapy and everyday task lighting in one attractive package. The white diffusing lens eliminates glare and evenly distributes the light. Two 55-watt light tubes emit a warm light and minimize potentially harmful blue rays. Hi-impact polycarbonate lens filters 99.3% of harmful UV rays. The height adjustable arm allows the light to be positioned at the appropriate height and angle for the user. This is the optimal light positioning recommended by light therapy experts. Manufactured with high efficiency, electronic ballasts, the Day-Light Sky eliminates the annoying flicker experienced with ordinary fluorescent fixtures. This product has the greatest surface area of light at the recommended wave frequency, is VERY sturdy, looks like a regular desk lamp, was packed with TLC, arrived 2 DAYS AFTER I ORDERED IT, was $50 less than the cost anywhere else on the internet and shipping was FREE! What's not to love?